An American college professor maintains a lengthy and unique bond with a Japanese dog rescued from a train station. Remake of Hachiko monogatari (1987). Inspired by the true story of Hachiko, a Japanese Akita dog noted for his loyalty to his owner even after said owner's death, Hachiko: A Dog's Story follows New England professor Parker Wilson and his unlikely connection to an abandoned Japanese dog after saving him from a train station. 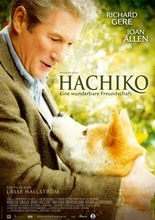 Initially intending to put the dog up for adoption, Parker takes him in as his own after forming an unexpectedly strong bond with the endearing pet, one that sees the dog -- named Hachiko, after a symbol translating to "Hachi" found on his collar -- waiting for Parker at his train station every day for ten years following his unexpected death from a massive heart attack.